The members of Ubar Grotto have a long history of involvement with the DeMolay program. Many of our Prophets were members of DeMolay when they were younger, while several more serve on Adivsory Councils and in other other capacities with the DeMolay program today. Either way, the Prophets of Ubar have continuously given unflinching support of Masonic Youth in the Commonwealth. Recently, at their annual meeting, the members of DeMolay International recognized several Ubarians for these contributions. We’d like to congratulate the following members who were elected to receive the DeMolay Legion of Honor. 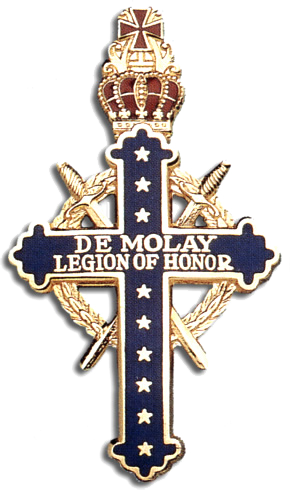 The Legion of Honor is the highest honor conferred by DeMolay International. It’s conferred on a Senior DeMolay for outstanding leadership in some field of endeavor or for success in fraternal life, including adult service to DeMolay. No one may apply for this distinction, and a nominee, or the membership of a Chapter, must have no knowledge of the recommendation by the Advisory Council. Also being honored was Pro. Thomas R. Labagh, Sheik of Ubar, who was made an Honorary International Master Councilor by Bro. Bob Laing, of Ohio, then International Master Councilor. Pro. Labagh provided much support and mentoring to Bro. Laing throughout his year and his efforts did not go unnoticed. Two other Ubarians were elected to membership in the Supreme Council of DeMolay International. Pro. Russ Baker, Sheik of Ubar, was made an Honorary Member, while Pro. Seth Anthony, Past Monarch, was elected a Deputy Member. Congratulations to all and thank you for supporting our Masonic Youth!